Charlie Levin lines up his putt on the Hole 1 green at Copper Mountain, with views of the SKY Chutes on the Tenmile Range in the background. Fitness experts suggest preparing for golf season by working out your core and arms. Season passes are currently $409 for unlimited play (no cart) and non-transferable four-pack passes are $169 (includes cart). For reservations, course cards and lesson info, including private lessons with new head teaching pro Zach Dobrota, see the course website at CopperColorado.com. This past December, golf instructor and longtime local Zach Dobrota broke his leg in a freak accident on killer Breckenridge ice. 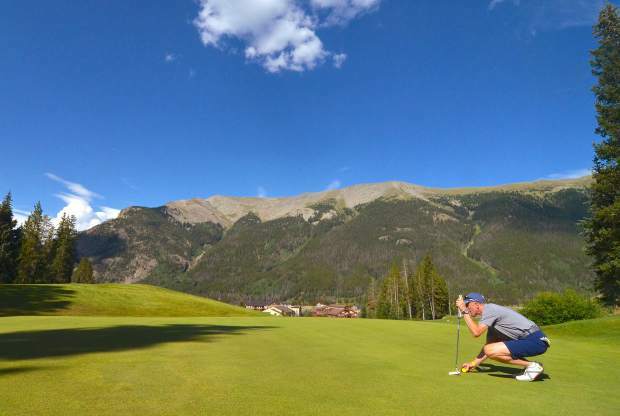 By February he was chipping and putting, by March he was playing a round in Florida, and by June 9 — the opening day of the season at Copper Creek Golf Course at the base of Copper Mountain — he was working through a full 18 with hardly any pain at all. Oh, and he didn’t even ski until April because, well, it just hurt too much. This season marks the Ohio native’s first as head teaching pro at Copper Creek, but he’s hardly a stranger to Rocky Mountain golf courses. After teaching at the prestigious Medinah Country Club in Illinois — home to the 2012 Ryder Cup and other PGA-level contests — he spent two years at the Raven at Three Peaks in Silverthorne, then headed to the Front Range for teaching at Cherry Hills Country Club and Common Ground Golf Course. All in all, Dobrota has been teaching golf technique, both physical and metal, since 2008. He brings a laid-back, golf-as-game approach to chipping, putting and driving. Sure, he might have the country club background, but he prefers the vibe of somewhere like Copper Creek, where locals and globetrotters alike come for a not-too-difficult round on fairways that cross World Cup-level ski runs. From private lessons to youth clinics to female-friendly sessions, Dobrota teaches it all, and he hardly even feels the broken leg at this point. Before golf season hits full swing (pun intended), the Summit Daily sports desk caught up with Dobrota to talk Copper Creek, golf fundamentals and why even coaches are constantly learning the endlessly complicated game of golf. Summit Daily News: Golf season at Copper almost literally just got started. How’s the course looking right now? Zach Dobrota: It’s good. The greens are starting to roll, things are looking good and it’s only getting better. SDN: You’ve lived in Summit County for more than a decade. Has golf always been part of summer for you? ZD: I either hit balls or play a round every day during the summer. Through high school I played a lot. When I went to college I took time away from the game, but my summers are pretty golf heavy these days. SDN: With so many other activities happening — biking, hiking, whatever — what do you like about spending time at Copper Creek? ZD: I like how the courses are different in the mountains, with all the elevation changes. Copper isn’t a long golf course, but it’s definitely narrow — more target golf. You don’t just get up in the tee box and rip on the ball. It makes you think, for sure, and it’s not like in Denver, where the courses are wide and open with no elevation changes. SDN: This is your first season teaching at Copper, but you’ve been teaching golf for nearly a decade. What drew you to this course? ZD: I’ve been everywhere from high-end private clubs to daily-fee courses, but it just seemed like when I sat down with (course superintendent) Scott (Sundeen) for the interview it was a good fit. It’s a unique facility in a way — it’s a resort course, but we have a ton of local pass holders. That was a good fit and they’ll also give me a little freedom to teach my own way, to take my own direction. I’ve been places where you’re under anther pro who wants you to teach their way. Every teacher has their personal way of teaching, whether it’s golf or a math class, and this is better. SDN: Describe your approach to teaching the game. What is most important to you? ZD: Most important is to be on the same page with who I’m working with. Everyone wants to get better and that’s the ultimate goal — to improve your golf game — but if we don’t see eye to eye it can be more difficult. I really want to mesh well with someone as a person. If we get to know each other, we get along better. I don’t just want to teach someone as a student, where you walk away and I walk away and that’s it. SDN: When you work with a new client, what’s the biggest thing everyone wants to work on? ZD: More than half of the people I talk to want to hit the ball further. The average golfer wants to hit the ball like a tour pro, especially off the tee. You can go to any driving range, anywhere, and most all of the time people will be hitting drivers. SDN: How do you reach that goal? Obviously not everyone can hit 350 yards like Tiger Woods. ZD: My first step for any student is to help them figure out how their body works. Not everyone is as flexible or strong or fit (as someone else). You can work out in the gym, but until you figure out what you’re working with on a personal level, you won’t get too far. Joe off the street won’t hit the ball as far as Tiger. I look at it in the sense that you need to understand how your body works with every club, to get those motor skills and that repetitive motion, and then we can start fine-tuning things like distance. SDN: As a teacher, then, what elements of the game are most important — the sort of things a client might overlook? ZD: The mental aspect of golf. A lot of people have a number in mind, a specific score, but what they don’t realize are the little things on the course that don’t let them do that. Poor game management is often more of a culprit for a bad score than hitting the ball poorly. Poor decisions on the course can get in the way. SDN: How can someone work on the mental side of the game when they don’t have a coach looking over their shoulder? ZD: I’m a big proponent of tracking your stats, so not exactly your score, but where you’re hitting on the fairway, or penalty strokes, or anything else. That will give you a better avenue, a better path, for how to focus your game. SDN: Let’s talk about your new home course. Do you have any favorite holes at Copper Creek? ZD: The front nine and the back nine are almost two different styles of golf. That front nine is very Pete Dye design, with the water and railroad ties. The fifth hole is a great risk-and-reward hole, especially if you hit the ball a long way. You have trouble down the left side and water on the right side, so you can play it smart and get a low number, or you can play it daring and get a big number. Then you have holes one, two, eight and nine, and those go right across the base of the ski runs. If you’ve skied Copper, you’ve probably skied on those holes. SDN: Along with private instruction, what else are you bringing to Copper Creek this year? ZD: Tuesdays and Thursdays in the mornings I’ll do kids clinics, and then in the evenings we have women’s clinics. Those will happen every week, and I’m sure we’ll sneak some other stuff in here and there, but as of now that’s our only set-in-stone plan for clinics. SDN: What are you personally working on with your game this summer? ZD: It’s been an ongoing battle for years, but I’m always looking to improve my short game. It’s such a touch-and-feel sort of thing, and when you walk away from it for months at a time like we have to up here, it can be tough to work on the feel and get back to where you want to be. That’s something I’ve struggled with a bit early this season.